Here's some encouraging news from the egg industry with a sunny side for hens: per capita egg consumption in the US has been steadily declining for the past six years! 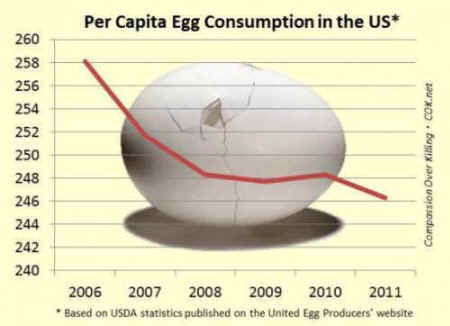 That's according to a recent Egg Industry Fact Sheet posted on the United Egg Producers' website, which is based on statistics from the US Department of Agriculture. As highlighted in the graph below, in 2006 the average American ate 258.1 eggs while the estimate for 2011 drops down to 246.3 -- that's nearly one dozen fewer eggs per person. Why are people eating fewer eggs? There's no doubt that in the past several years the egg industry's reputation has been cracking as undercover investigations inside egg factory farms -- from California to Pennsylvania to Minnesota to Maine to Iowa and elsewhere -- expose the miserable and unsanitary conditions forced upon hundreds of millions of laying hens confined in tiny wire battery cages for their entire lives. We've also seen several companies reducing or eliminating their use of eggs, including Morningstar Farms, Lightlife, BOCA Foods and Quorn, as well as adding more vegan options to the marketplace. As a growing number of consumers discover the rotten realities about egg McMuffins and the hard-boiled truth of egg production overall, the interest in leaving eggs out of our shopping carts will hopefully continue to rise. With so many wonderful vegan cookbooks, recipes, baking tips, and products available today, it's never been easier to crack the habit and choose egg-free foods.